Sledding hills, skating ponds, and cold, clear nights! 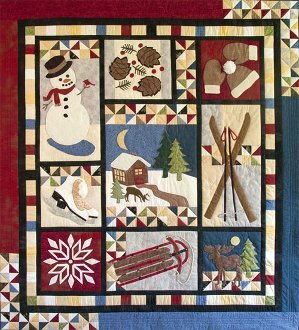 Here is a quilt with simple piecing and fusible appliqué designs that celebrates the joys of winter. Optional embellishments (pom-poms, nailheads, ribbon, buttons) add detail - your scraps provide variety. Bonus projects and alternate block settings included!